Make your closet a space to show off with custom finishes that complement your existing design aesthetic. Imagine for a moment the inside of your closet. If you shuddered just thinking about the amount of unnecessary stuff that you have built up over the years, you may want to consider a new storage solution. A well designed and organized closet can help you not only cut the clutter out of your home, but also help you make it to work on time, find long forgotten mementos from the past and simply make your home a more calming place to spend your time. However, cleaning out and redesigning your closet is just the beginning. You also have to consider all of the material and finish options available and how they fit your home’s aesthetic as well as your lifestyle. It’s an intimidating task, but one we won’t let you go alone. 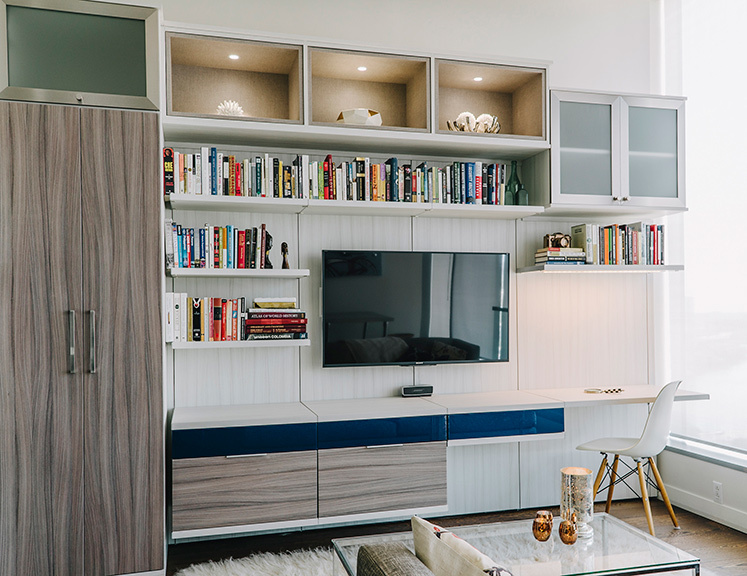 That’s why we reached out to three of St. Louis’ most esteemed storage design companies to get the scoop on what materials, finishes and design practices are available to you in St. Louis. Additionally, with melamine, there’s no shortage of options available for finishes. Most of the time, companies are able to stock around 10 to 12 varieties of colors and finishes. At St. Louis Closet Company, founder Jennifer Williams says they offer a total of 12, including two Italian-inspired textured laminates with a raised wood-grain pattern. Similarly, and because textured materials are trending so heavily, Beyond Storage also offers a raised wood-grain textured laminate in addition to a variety of standard colors and finishes. There are also a number of companies that are beginning to specialize in high-end imported Italian materials, as well as an assortment of Italian-inspired materials produced in the United Stated. As a result, storage design companies are making it a great deal easier to find even the most exclusive materials in our area. 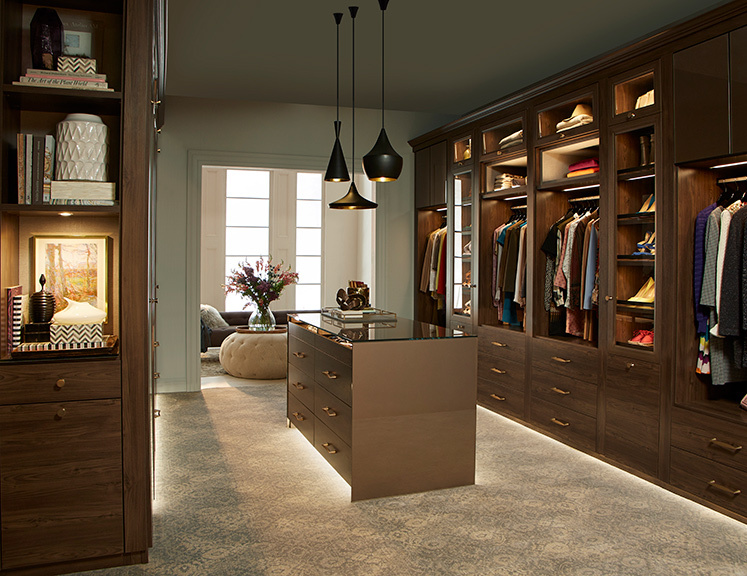 An effort summed up by Stephanie Cline of California Closets as “luxury at any level.” These high-end materials comes in an assortment of patterns and finishes that are trending heavily right now and are starting to become a prominent choice among St. Louis homeowners. Once you’ve discovered the right material and look for your closet, you’re almost there; but there’s still one thing to consider and that’s floating versus floor-based design. Each have their merit with floor-based giving you more shelving that can run from the ceiling to the carpet, while floating gives you the flexibility to choose how close to the ground your shelving comes. The latter option is great for anybody who plans to store large items that wouldn’t normally fit into a shelf. Despite the differences between companies, each prides themselves on being 100 percent custom. They offer a huge variety of woods and laminates in a ton of styles, they can design for any space big or small and they work with anyone from those with tight budgets to those where money is no option. So, swing into any of St. Louis’ storage design companies and find out how you can accommodate anything from new closets to pantries to murphy beds.